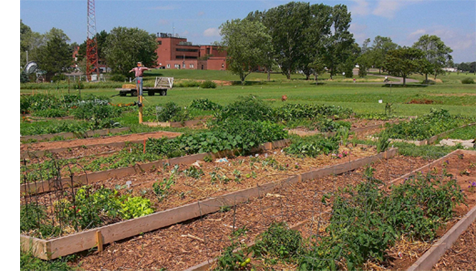 The Farm Centre's Legacy Garden, is situated on 8.5 acres of farmland (zoned agricultural) located in the heart of Charlottetown. The Garden includes a two-acre, 'Goodwill Garden' which supplies fresh, naturally grown produce to local charities, homeless individuals. On occasion we will also cook and serve delicious meals in the Centre. Many projects are undertaken in cooperation with hundreds of enthusiastic volunteers who work with us to grow the garden and a great community. They too benefit from the bounty of the Farm Centre Legacy Garden. On another two acres, our 150 community garden plots are carefully tended by gardeners from all walks of life; young families, seniors and newcomers. Newcomers to Canada have enthusiastically embraced the idea of participating in the community garden; we look forward to learning from them! The success of our children's garden will ensure the future of our Island transition. By planting ideas of sustainability in young minds we can change tomorrow's outcomes. Imagine how motivating it will be for children to watch their beans sprouting to cover teepee poles with sturdy vines or corn kernels grow into towering sunflowers. If that doesn't ignite a passion for gardening, tasting their sweet, juicy berries certainly will. Carving their Halloween pumpkins will add extra incentive. Special needs gardeners can also get involved - from the ground up! We are building elevated beds for easy access. The Farm Centre is situated on 8.3 acres of farmland (zoned agricultural) located in the heart of Charlottetown. Agriculture and Agri-Food Canada is planting experimental crops comparing various native and imported plants. All aspects of the garden have an educational aspect. Explanatory signs informing visitors and encouraging further investigation, experimentation and/or home planting will be mounted. Our own gardeners and various experts will lead workshops, training sessions and seminars in the Farm Centre and demonstrations in the garden. We host cooking classes and cater from our commercial kitchen.